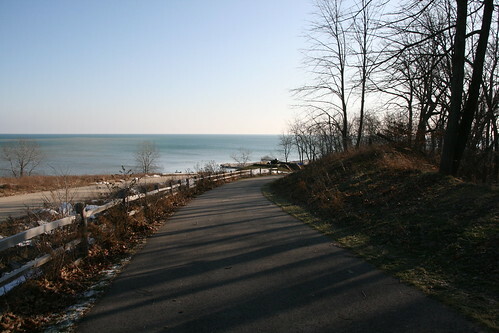 There is a 1.3-mile asphalt trail as well as a shorter 0.3-mile woodchip trail open to hiking and cross-country skiing. Along the trail we found informative signs about the park’s natural resources as well as its military history. 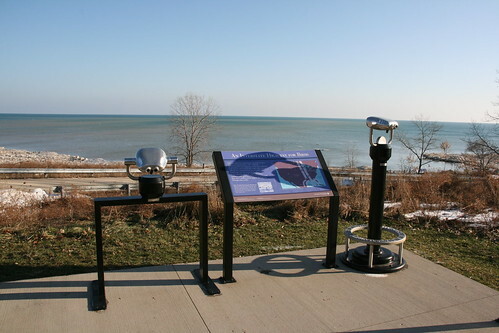 At the end of the asphalt trail is an overlook with two fixed binoculars. We saw a lot of birds floating between the ice floes, among them several Common Goldeneyes. We also saw groups of hundreds of geese flying south in the distance. 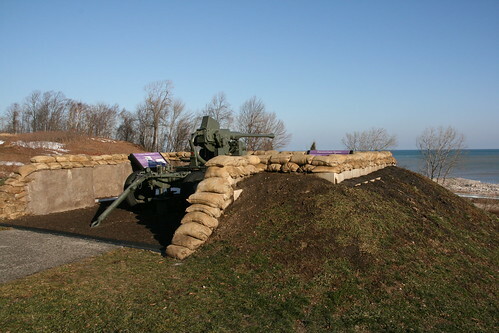 Next to the binoculars is displayed an old 44mm automatic antiaircraft gun, a reminder of when Fort Sheridan was an army base. 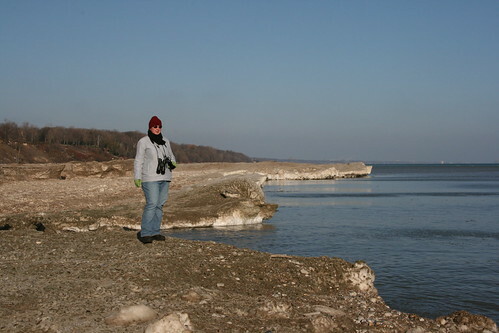 There were signed posted that swimming, wading and watercraft are not permitted on the Forest Preserve section of the beach because of potential unexploded ordnance underwater. I sure hope they’ll be able to clean that up once, this being the only public beach in this area. What a shame! 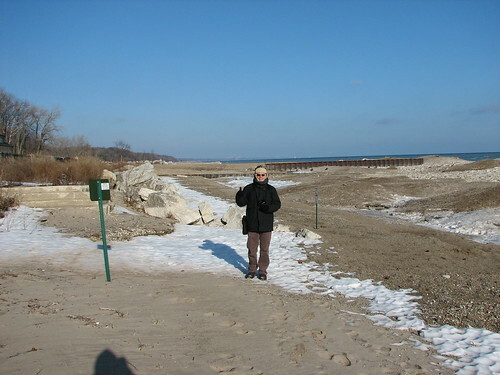 We walked along the 3/4-mile of sandy shoreline. 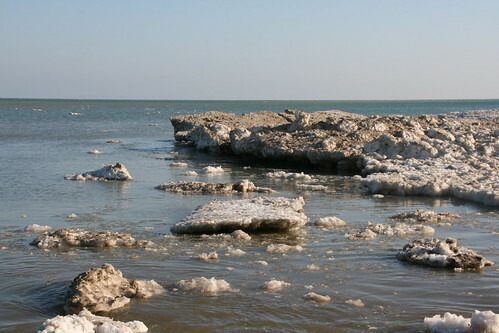 Parts of it were covered in thick ice which extended far into the lake. 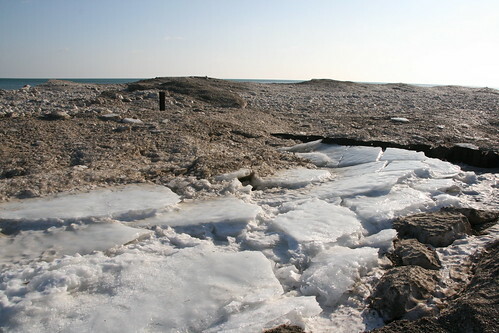 Huge ice floes were floating along the shore. It was hard to distinguish the ice from the land, which made it quite treacherous. 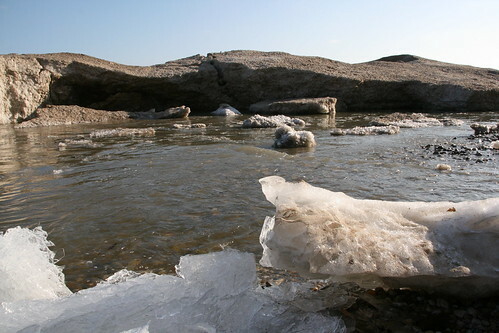 The ice extended far into the water and we could see holes in which the water was sloshing around. There was big thaw yesterday, so these are only the remnants of all the snow and ice from last week. Here follows a short video panning from a small waterfall to the huge icebergs. You can’t even see the lake here, which is behind all the ice. 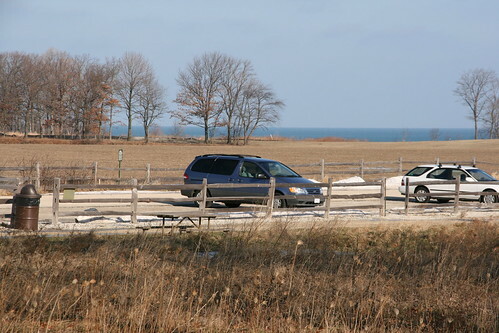 For more information see the Lake County Forest Preserves website. 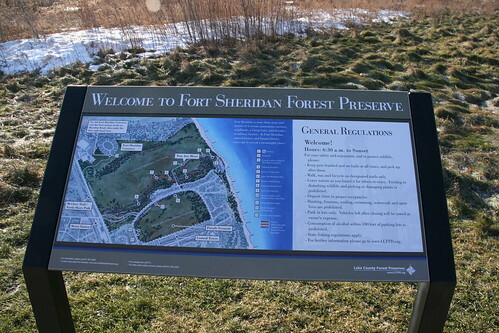 This entry was posted on Sunday, December 28th, 2008 at 5:09 pm CET and is filed under Forest Preserves, Life in America, Nature	with tags Illinois, Lake County Forest Preserves. You can follow any responses to this entry through the RSS 2.0 feed. You can leave a response, or trackback from your own site.